To cite this paper: Léa Yammine, "On Mixed Identities, Racism, and Activism in Lebanon; A Discussion with Nisreen Kaj. ", Civil Society Knowledge Centre, Lebanon Support, 2017-10-01 00:00:00. Saint Coeur, Beit Chabab (March 1974), courtesy of Nada El Sheikh, for the Mixed Feelings project. In a recent article published in the New Yorker, which was quite popular online, mixed marriages between citizens of two different countries are described as playing a part in developing compassion and understanding between people in the world: “The awareness and negotiation of small differences add up to a larger understanding about the complexities of the world.” Amidst growing globalisation, mixed marriages are indeed increasingly common and appreciated for their transnational multiculturalism. In Lebanon, however, due to the exodus of its citizens and its attributed “cosmopolitanism,” such intermixing is not a new phenomenon. Instead of being met with greater empathy, however, the children of some of these marriages are met with racism and marginalisation. Nisreen Kaj is the child of a Lebanese national and a Nigerian national. When she turned 19 years old, she moved to Lebanon to pursue her higher education in her father’s country, and learn more about Lebanon’s culture as she had been living in Nigeria up until then. For Nisreen, racism is by definition a systemic, intersectional issue; it is a result of a legal framework and of socio-cultural constructs. It is a complex process of racialisation that touches on being a black woman in Lebanon, which often means being assumed to engage in a profession that is gendered, perceived as unclean and lower-class work. She has faced criticism, even from close friends, about her physical features like her forehead shape, the darkness of her skin and her hair. Thus, these comments went beyond race and compounded the aspects she was criticised for. Around 2008, Nisreen attended a talk by the International Labour Organisation (ILO) on Migrant Domestic Workers (MDW) and the kafala system – under which migrant domestic workers opearte – which proved to be eye-opening about the bigger picture of racism she had been experiencing, and explained how this racism was deeply inscribed in Lebanese society. It allowed her to put things into perspective when it came to her understanding of racism: an array of intersecting oppressions which include gender, race, class, and socio-economic status. Shortly after that, Nisreen started volunteering with a group supporting the rights of domestic workers. This involvement introduced her to cultural initiatives about race, and activism about MDW. It led her to collaborate with many initiatives and organisations over the years, like Taste Culture, Anti Racism Movement (with whom she is still involved as part of the advisory board), Insan association, Human Righst Watch, etc. Throughout this volunteerism, Nisreen met a lot of people who played an influential role in her trajectory, some of whom are still present in her life and provide support and advice. It allowed her to envision and eventually start planning one of her main activist projects, the “Mixed Feelings” project which explored racism in Lebanon through the experiences of Lebanese of African or Asian heritage. The idea for the “Mixed Feelings” project came about after having a discussion with an African American friend who was giving an ethics workshop at the American University of Beirut at the time and was trying to explain to students how racism was exemplified in the kafala (sponsorship) system, and that it wasn’t merely an issue of class. The project was put on hold after Nisreen’s friend left the country some time later, only to be initiated again when Nisreen met photographer Marta Bogdanska. Their collaboration materialised as the first phase of “Mixed Feelings” which consisted of an exhibition of over 30 photos of Lebanese of mixed origins, with their names, the villages they’re from, and quotes from interviews with them. The exhibition showed at various venues around the country with talks organised in parallel. The project challenged visual perceptions in order to show racism in the Lebanese context and from a Lebanese perspective. As Nisreen was personally involved in the project, she worked on it while applying to her MA in Racism Studies at the University of Leeds and carried on with her efforts abroad. Her research project was in fact based on the portraits and interview she already had, which permitted her to develop the project into a more academically-sturdy analysis. Consequently, the project became very dialogue-based, with talks organised with speakers from the field every time the exhibit was showing in a new venue. The overall objective was to raise awareness and create a discussion on the notions of mixed race in Lebanon. The project was collaborative and involved the participants who had their portraits taken and exhibited: they participated in some activities relevant to planning, and gave interviews to media outlets about the project. Nisreen gave participants ownership of the project and accordingly, many became invested in it, volunteering on the ground, and attending talks to address questions and talk to attendees. In its first phase, “Mixed Feelings” toured 6 locations from the south (Sour) – as earlier waves of migration to West Africa originated from south Lebanon –to the north (Tripoli) of Lebanon, in collaboration with universities as well as municipalities. In its second phase, the exhibition evolved to include family pictures. The team met 17 families and heard stories from the perspectives of the rest of the families, specifically the foreign mothers, which highlighted its own set of human experiences of racism in Lebanon. Likewise, the second phase aimed to underscore the various dynamics at play when a family is mixed. For Nisreen, family is a core unit of institutions in Lebanon, from religion to politics, which made it the obvious next step for the project, as it demonstrates how sameness and otherness are negotiated within the family unit, and how this affects different family members. 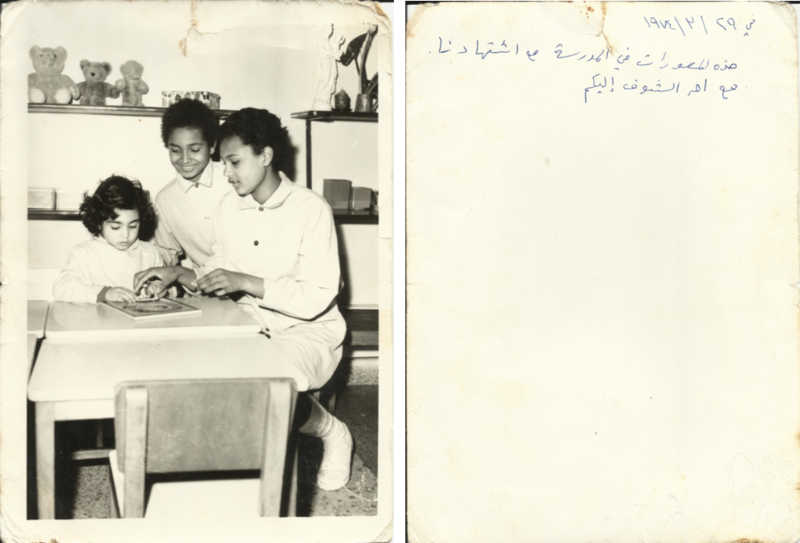 Through personal archives of family photos – a very familiar and relatable medium – this second part of the “Mixed Feeling” project brought the importance of solidarity within a family, and the role men play in making their families accept the women they choose as partners, to the forefront. Nisreen pointed out here that these stories were enjoyable to discover on the human level, and not just in the scope of research. Deeming racism a very sensitive topic to discuss, Nisreen understands how most civil society actors address the issue of racism through other lenses and under different “umbrella” themes, such as migrant domestic workers and the kafala system, part of a larger focus on labour. However, she finds it essential to focus on legal issues, tailored towards action, advocating and lobbying for actual law reforms, as racism is an issue on the systemic level. Additionally, she considers there is a need for sensitivity training on an institutional level, in schools, workplaces, and for members of the LAF and ISF, in addition to the monitoring and proper implementation of such trainings. Most importantly, she points out the need to include and involve migrants and black people in these actions. Nisreen brings up the needs for sustainable and independent modes of operations, as well as the need for more collaboration. Indeed, echoing the findings from Lebanon Support’s report on gender interventions, she also mentions duplication of work, possessiveness over funds, and the shifting of programmes according to funding as creating hindrances and setbacks for work addressing discrimination. While she personally finds marches to sometimes be alienating and intimidating as a woman of colour, activism is, for Nisreen, ongoing: like the women and people from the “Mixed Feelings” project who always try to educate those around them. Still, she is reluctant to identify as an activist since she is not always working in the field and proactive, and doesn’t want to undermine the daily activism of other less visible people. She also points out that some self-identified activists are privileged, and even detached from the issues they advocate for. Above all else, Nisreen values creating dialogue as the way forward – whether with individuals, or on a programming level where she sees it essential to involve the private sector, education sector, or municipalities, rather than restricting activities and interventions to the non-profit and third sector. In that vein, she would like to carry on working on cultural exchanges in the future, specifically highlighting the cultural interactions between Lebanon and the continent of Africa, notably West Africa. This article is based on an interview by the author with Nisreen Kaj, Beirut, July 2016. Lebanon Support, “Overview of Gender Actors & Interventions in Lebanon. Between Emancipation and Implementation,” Civil Society Knowledge Centre, 2016, available at: http://civilsociety-centre.org/resource/overview-gender-actors-interventions-lebanon-%D9%84%D9%85%D8%AD%D8%A9-%D8%B9%D8%A7%D9%85%D8%A9-%D8%B9%D9%86-%D8%A7%D9%84%D8%A3%D8%B7%D8%B1%D8%A7%D9%81-%D8%A7%D9%84%D9%81%D8%A7%D8%B9%D9%84%D8%A9-%D9%81%D9%8A-%D9%85%D8%AC%D8%A7%D9%84-%D8%A7%D9%84%D8%AC%D9%86%D8%AF%D8%B1 [last accessed 10 October 2016]. Léa Yammine is Director of Publications at Lebanon Support, and has collaborated on developing online and print publications on several themes including conflict analysis, gender equity, historical conflict and transitional justice, and civil society interventions. She holds a BA in Graphic Design from the American University of Beirut, and an MA in Culture, Creativity & Entrepreneurship from the University of Leeds, UK.